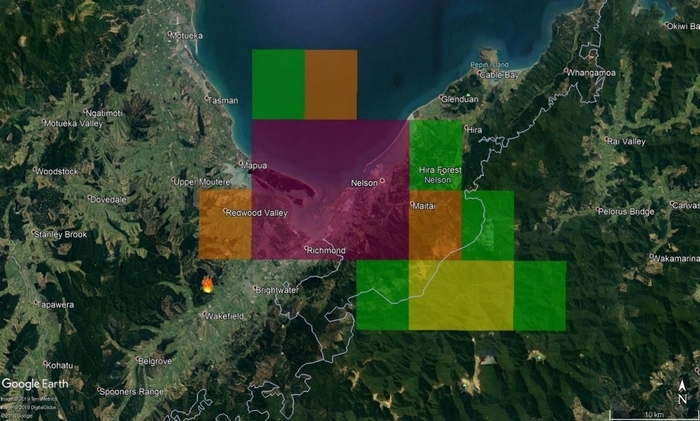 Scion’s Rural Fire Research team has updated their forecast of the likely path of the smoke plume from the Pigeon Valley fire near Wakefield, Nelson as it comes under control and is extinguished. The smoke plume footprint provides a good indication of where the smoke will go for February 12-14 based on forecasted weather and wind directions. If fire activity or smouldering persists, smoke hazard remains medium to high. High smoke hazard is predicted for Redwood Valley, Richmond, Nelson City, Maitai, Mapua, Brightwater and Wakefield during the early morning of Tuesday 12 February. The Nelson airport may be affected by visibility impacts. High smoke hazard is again predicted for Mapua, Richmond and Nelson City (including the airport) on Thursday morning 14 February, if fire activity and/or smouldering persists. Smoke may reach Havelock, Renwick, Blenheim and Seddon later Tuesday morning and into the early afternoon. Smoke hazard is possible at Redwood Valley and Mapua on Wednesday morning. A medium smoke hazard is predicted for Wakefield, the Tasman tourist areas, Mapua, Richmond and Nelson City (including the airport) on Wednesday afternoon. Check out the Rural Fire Research team’s blog for updates. Image: Smoke prediction for Tuesday, 12 Feb 2019 at 7am. Green – very light; Yellow - light; Orange - medium; Purple - heavy.